Your body has three energy systems that power movement. These are the oxidative, glycolytic, and ATP-Pcr systems, each of which serves a unique role in fueling your sprint performance . All three systems contribute to supporting energy requirements, but their relative contributions change with the duration and intensity of your efforts. The oxidative system contributes heavily to almost all types of endurance exercise. It works slowly, but is extremely efficient at supplying ATP (gives energy) to cells in demand. It always contributes, even while sprinting, but it is the main contributor during longer efforts or submaximal efforts. The contribution of the oxidative system during a true, single, short sprint is small (<30 sec) , but a robust oxidative system plays a crucial role in the parts of a race leading up to the sprint where repeated hard efforts are occurring [3, 4]. The oxidative system is involved in the length of your sprint and continued force production as well . Since the intensity in the minutes leading into sprint finishes is typically high, we can’t rule out the importance of having a well-developed oxidative system to deliver you to the finish . The glycolytic system acts as an intermediate supplier. It works faster than the oxidative system, but is not quite as efficient. The reliance on the glycolytic system during a maximal sprint is very high, especially if the sprint lasts longer than a few seconds . The glycolytic system mainly powers high intensity efforts when energy demand is too high for the slower oxidative system to keep up. It is contributing at all time, but is a main contributor to maximal efforts that are in 5-75 sec range . This means that it is key in meeting the demands of high intensity portions of a race, as well as the sprint itself. The ATP-Pcr system is the fastest, yet least efficient supplier of ATP to cells in need. Its ability to work extremely fast makes it the primary contributor during a short, maximal effort, like a sprint. The extremely rapid regeneration of ATP from the ATP-Pcr system doesn’t last long; its contribution begins to fade after just a few seconds . Understanding the energy systems is key in training your sprint performance. Determining which systems to target and designing high intensity workouts that challenge these systems properly is key in improving your sprint at the end of a race [7, 8]. Targeting your glycolytic and ATP-Pcr systems means regularly incorporating high intensity work and sprinting into your training. 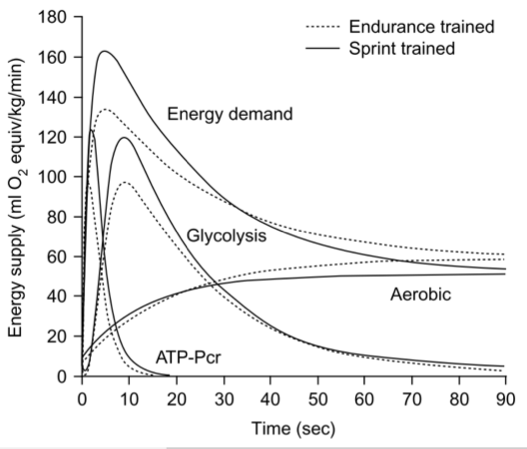 Together, the ATP-Pcr and glycolytic systems support high rates of peak power during a sprint. The graph below shows the energy system contributions of cyclists who regularly perform sprint training, compared to triathletes who do not during a 90-sec all-out effort. 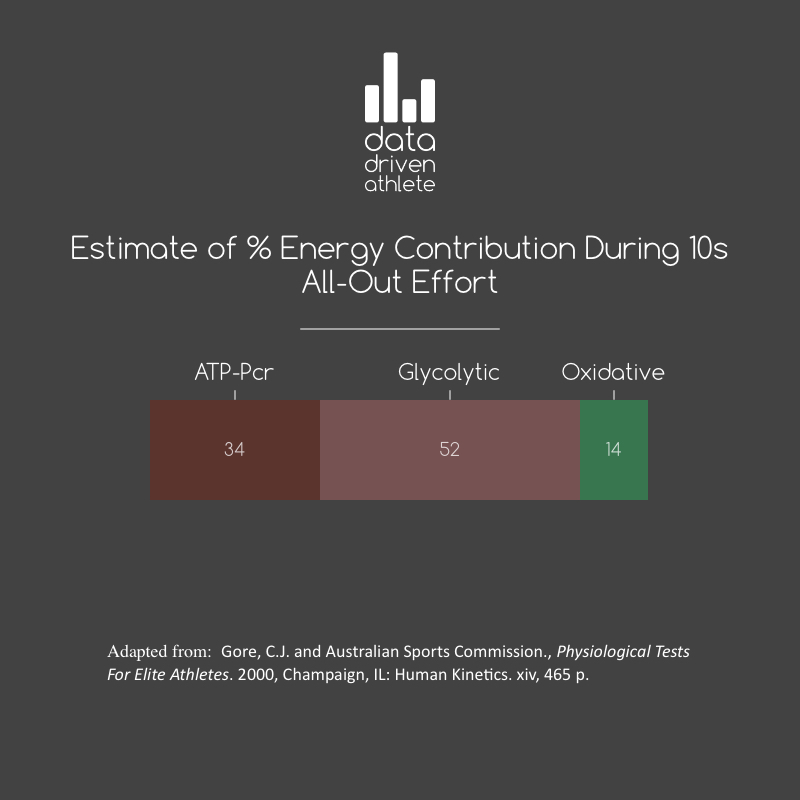 The sprint trained cyclists have a significantly greater glycolytic and ATP – Pcr contributions to support their high peak power. Gastin, P.B., Energy system interaction and relative contribution during maximal exercise. Sports Med, 2001. 31(10): p. 725-41. What exactly are the energy systems providing energy to? When you are cycling, much of their efforts are responsible for keeping your muscles working. The ATP that is being produced is being used by various components of working muscles so that they can continue to contract and relax. Is there potentially a limitation to your sprint power in your muscles’ maximal contraction abilities, just like the energy systems that power its ongoing contractions? The maximal contraction force and velocity produced by your muscles is a limiter to your power production. The ability to generate both high force and velocity (power) is influenced by physical characteristics in the muscle itself, and by the effectiveness of the nervous system in controlling the activation of the muscle [9, 10]. Since there is a very strong relationship between maximal strength and maximal power production, another way to improve your sprint performance is to train the contractile, structural, and neuromuscular components of the muscle . We won’t dive into muscle fiber typing (fast twitch vs. slow twitch), as regardless of fiber type, peak power is trainable. This doesn’t mean that you can be a world class sprinter, but you can improve. It has been shown that through many different types of strength training like explosive plyometric exercises and heavy weight training, sprint power output can be increased [10-17]. Much of this improvement is thought to occur through neural adaptations, since increases in muscle cross sectional area are minimal while performing concurrent endurance training [15, 18-20]. Methods for “strength training” on your bike, such as low-cadence/maximal sprints have been shown to increase power as well, but may hinder power production at higher cadences . It might make more sense to strengthen the musculature involved in sprinting without providing an opportunity to alter the coordination pattern of your sprint. Think back to the first time that you tried sprinting. Did you cut your knees on your stem bolts? Do you still cut your knees on your stem bolts? Did you weave side to side? Over-geared…. Under-geared? Sprinting on your bike is a very complex movement pattern since it requires maximal power output and coordination from the legs as well as the upper body . In complex movements requiring high power output like Olympic weightlifting exercises, it has been shown that familiarization with the movement plays a key role in power production [22, 23]. Proper inter-coordination of muscles, controlled by the nervous system, allows you to generate and deliver power efficiently. Since force production – not just from each individual muscle, but synergistically in a given context (like a sprint) is very important, coordination is another potential area of improvement for your sprint [9, 24]. Practicing your sprint form often can lead to beneficial changes in the nervous system as you continue to become more familiar with the complex movement pattern of sprinting at higher cadences/power outputs [25, 26]. This means that when the time comes at the end of a race, throwing down a well-coordinated sprint is second nature. Don’t just wait until a group ride, race finish, or sprint workout to practice your sprint form. Try tossing some short practice sprints into more of your workouts. One way to improve coordination is to develop the ability to sprint out of the saddle at higher cadences. There is evidence showing that as power output increases, higher cadences provide better muscle activation, making the higher cadences optimal . Certainly, there are limits here, since sprinting at 200 rpm may not necessarily mean more power production. There seems to be an apex around 120-130 rpm, where the balance between optimal muscle activation and boundaries of the force-velocity relationship meet [21, 28]. Sprinting at these high cadences enables a rider to achieve better peak power for the first few seconds, but the rate of fatigue during a prolonged sprint is greater . This means that as sprints get longer, you may want to grab a gear or two to adopt a slightly lower cadence over time. Try a couple of short sprint efforts on your next ride and look at your cadence when you upload it. While 120-130 rpm may not be the best for you, if you are sprinting at 75-80 rpm by default, you can probably improve through practice. How much time and effort should you spend working on your sprint? Do you reach the end of a race fresh, or are you in trouble from the whistle? 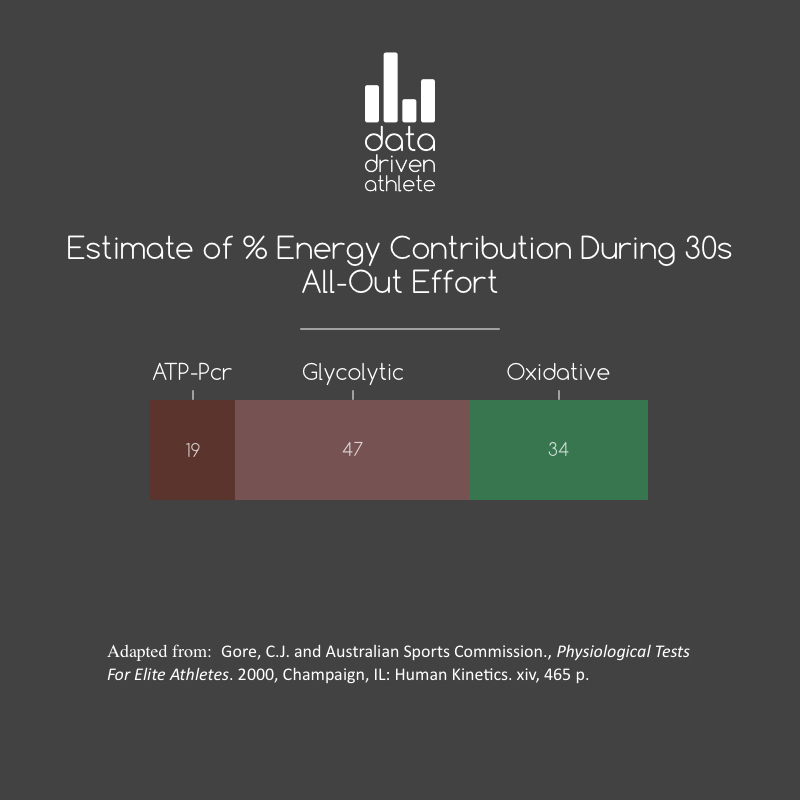 If just being in the group is challenging your abilities, you may spend more time developing your oxidative and glycolytic systems, so that you can reach the race finish with minimal depletion of your glycolytic and ATP-Pcr systems. Spending a large portion of your training time working on your sprint may not make sense until you have the means to deliver it. 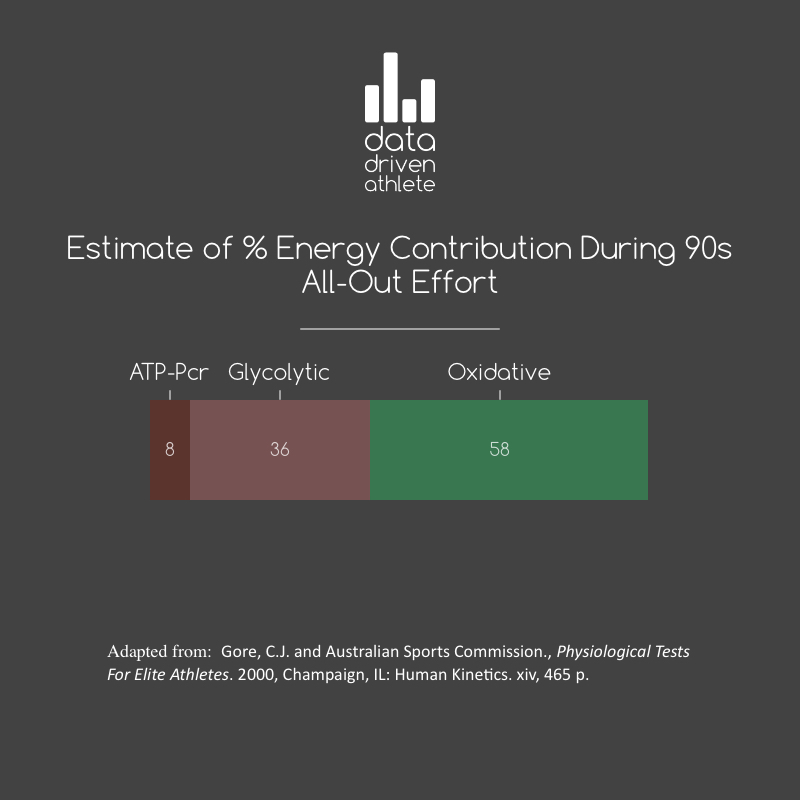 Since the intensity in the minutes leading into sprint finishes is typically high, we can’t rule out the importance of having well-developed oxidative and glycolytic systems to deliver you to the finish . Work on coordination and familiarity, but you might have better results using this as a supplement to other training. Design a well-balanced training program that incorporates development of all three energy systems. Don’t overlook the importance of shorter, high-intensity efforts in sprint performance. Consider incorporating strength and neuromuscular power training into your program. Do not wait until a group ride, race, or sprint workout to practice your sprint. Incorporate short practice sprints into more of your rides to enhance coordination. Consider the potential trade-off involved in spending a large portion of your time training your sprint. Be the first to know about new blog posts while getting inside training tips delivered to your inbox. No spam, ever, we promise. McArdle, W.D., F.I. Katch, and V.L. Katch, Exercise Physiology: Nutrition, Energy, and Human Performance, 8th Edition. 8 ed. 2015, Baltimore, MD: Wolters Kluwer Health, Lippincott Williams & Wilkins. Bogdanis, G.C., et al., Contribution of phosphocreatine and aerobic metabolism to energy supply during repeated sprint exercise. J Appl Physiol (1985), 1996. 80(3): p. 876-84. Peyrebrune, M.C., et al., Estimating the energy contribution during single and repeated sprint swimming. Scand J Med Sci Sports, 2014. 24(2): p. 369-76. Bundle, M.W., et al., A metabolic basis for impaired muscle force production and neuromuscular compensation during sprint cycling. Am J Physiol Regul Integr Comp Physiol, 2006. 291(5): p. R1457-64. Menaspa, P., et al., Physical Demands of Sprinting in Professional Road Cycling. Int J Sports Med, 2015. 36(13): p. 1058-62. Buchheit, M. and P.B. Laursen, High-intensity interval training, solutions to the programming puzzle. Part II: anaerobic energy, neuromuscular load and practical applications. Sports Med, 2013. 43(10): p. 927-54. Buchheit, M. and P.B. Laursen, High-intensity interval training, solutions to the programming puzzle: Part I: cardiopulmonary emphasis. Sports Med, 2013. 43(5): p. 313-38. Cormie, P., M.R. McGuigan, and R.U. Newton, Developing maximal neuromuscular power: part 1 – biological basis of maximal power production. Sports Medicine, 2011. 41(1): p. 17-38. Cormie, P., M.R. McGuigan, and R.U. Newton, Developing maximal neuromuscular power: part 2 – training considerations for improving maximal power production. Sports Med, 2011. 41(2): p. 125-46. Vikmoen, O., et al., Strength training improves cycling performance, fractional utilization of VO2max and cycling economy in female cyclists. Scand J Med Sci Sports, 2016. 26(4): p. 384-96. Ronnestad, B.R., et al., Strength training improves performance and pedaling characteristics in elite cyclists. Scand J Med Sci Sports, 2015. 25(1): p. e89-98. Ronnestad, B.R., E.A. Hansen, and T. Raastad, Effect of heavy strength training on thigh muscle cross-sectional area, performance determinants, and performance in well-trained cyclists. Eur J Appl Physiol, 2010. 108(5): p. 965-75. Paton, C.D. and W.G. Hopkins, Combining explosive and high-resistance training improves performance in competitive cyclists. J Strength Cond Res, 2005. 19(4): p. 826-30. Mujika, I., B.R. Ronnestad, and D.T. Martin, Effects of Increased Muscle Strength and Muscle Mass on Endurance-Cycling Performance. International Journal of Sports Physiology & Performance, 2016. 11(3): p. 283-289. Koninckx, E., M. Van Leemputte, and P. Hespel, Effect of isokinetic cycling versus weight training on maximal power output and endurance performance in cycling. Eur J Appl Physiol, 2010. 109(4): p. 699-708. Del Vecchio, L., et al., Effects of Combined Strength and Sprint Training on Lean Mass, Strength, Power and Sprint Performance in Masters Road Cyclists. J Strength Cond Res, 2017. Jenkins, N.D.M., et al., Greater Neural Adaptations following High- vs. Low-Load Resistance Training. Front Physiol, 2017. 8: p. 331. Griffin, L. and E. Cafarelli, Resistance training: cortical, spinal, and motor unit adaptations. Can J Appl Physiol, 2005. 30(3): p. 328-40. BAAR, K., Training for Endurance and Strength: Lessons from Cell Signaling. Medicine & Science in Sports & Exercise, 2006. 38(11): p. 1939-1944. Martin, J.C., C.J. Davidson, and E.R. Pardyjak, Understanding sprint-cycling performance: the integration of muscle power, resistance, and modeling. Int J Sports Physiol Perform, 2007. 2(1): p. 5-21. Haug, W.B., E.J. Drinkwater, and D.W. Chapman, Learning the Hang Power Clean: Kinetic, Kinematic, and Technical Changes in Four Weightlifting Naive Athletes. J Strength Cond Res, 2015. 29(7): p. 1766-79. Flanagan, S.D., et al., Cortical Activity during a Highly-Trained Resistance Exercise Movement Emphasizing Force, Power or Volume. Brain Sci, 2012. 2(4): p. 649-66. Carroll, T.J., S. Riek, and R.G. Carson, Neural adaptations to resistance training: implications for movement control. Sports Med, 2001. 31(12): p. 829-40. Adkins, D.L., et al., Motor training induces experience-specific patterns of plasticity across motor cortex and spinal cord. J Appl Physiol (1985), 2006. 101(6): p. 1776-82. Jensen, J.L., P.C. Marstrand, and J.B. Nielsen, Motor skill training and strength training are associated with different plastic changes in the central nervous system. J Appl Physiol (1985), 2005. 99(4): p. 1558-68. MacIntosh, B.R., R.R. Neptune, and J.F. Horton, Cadence, power, and muscle activation in cycle ergometry. Med Sci Sports Exerc, 2000. 32(7): p. 1281-7.
van Soest, A.J. and L.J. Casius, Which factors determine the optimal pedaling rate in sprint cycling? Med Sci Sports Exerc, 2000. 32(11): p. 1927-34. TOMAS, A., E.Z. ROSS, and J.C. MARTIN, Fatigue during Maximal Sprint Cycling: Unique Role of Cumulative Contraction Cycles. Medicine & Science in Sports & Exercise, 2010. 42(7): p. 1364-1369. Gore, C.J. and Australian Sports Commission., Physiological Tests For Elite Athletes. 2000, Champaign, IL: Human Kinetics. xiv, 465 p.